TD Aeroplan Banking Targeted 115k Offers!!! 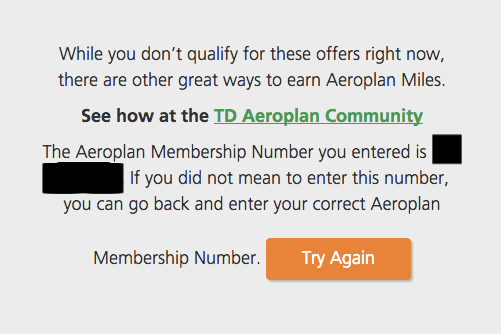 TD has been issuing Aeroplan co-branded credit cards in Canada for a few months, and they’ve had I one public promotion in April, where the first year annual fee were waived on some of their credit cards. A reader forwarded an TD Aeroplan Banking offer he was targeted for allowing him to earn up to 115,000 Aeroplan miles by opening new banking accounts. That’s right, my title wasn’t wrong and your eyes aren’t seeing incorrectly. 115,000 Aeroplan miles! That’s almost enough for a mini-RTW in business class. To my knowledge he does have a TD Aeroplan credit card. You can actually check your eligibility for these offers online through this link here. If you’re targeted you’ll probably be directed to a different page. Unfortunately, none of my accounts I manage were targeted, even though some do have a TD Aeroplan Visa linked to the account. You’d probably get a message similar to the one below for a non-targeted account. For opening checking, savings, investment, and cross-border banking accounts, you could earn 75,000 miles and an additional 10,000 mile bonus for opening all their products, which is incredibly impressive. The Small Business offer is for 30,000 Aeroplan for a combined total of 115,000 miles! The easiest way to accumulate 25,000 Aeroplan miles in Canada is the American Express Gold Card, which offers 25,000 Membership Rewards points after $500 in minimum spending within the first six months of holding the card. These points transfer at a 1:1 ratio to Aeroplan. Luckily, this is a public offer. I’ve listed the bonuses below. c. An online bill payment from the Chequing Account either through EasyWeb or the TD mobile app. • Link your TD Canada Trust Account and TD Bank, America’s Most Convenient Bank, Account through TD Cross-Border Online Account Portfolio View by October 31, 2014. • Maintain a $50,000 minimum balance between November 1, 2014 and January 31, 2015.